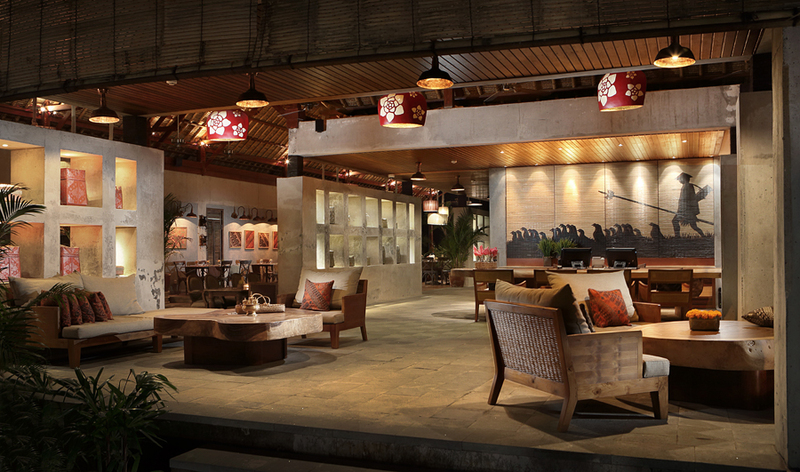 The open air lobby of Alaya Ubud. The Look: From first sight, the airy lobby’s organic aesthetic of Andesite stone, exposed concrete, and raw wood immediately surrounds guests in the relaxing and calming ambience that pervades the property. 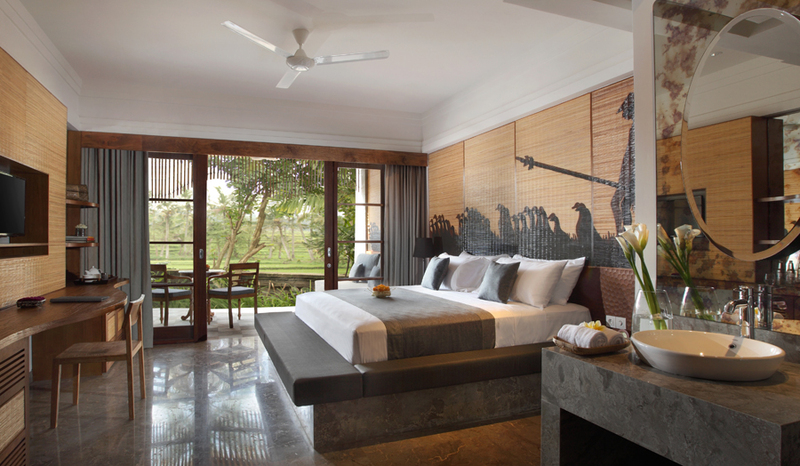 Rooms look out over rice fields. 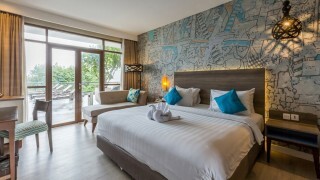 The Rooms: Rooms feature decorative walls that showcase Bali’s creative side with indigenous art pieces, and first-class amenities come as LCD TVs and luxurious bathrooms with soothing rain showers. 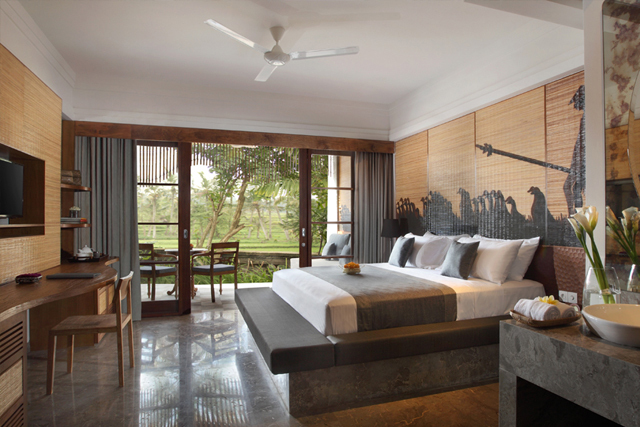 Each room comes with a private balcony, where guests can read or dine with unobstructed views of the surrounding rice terraces. Choose the Alaya Room to experience a customized stone bathtub that promises spa-style bathing indulgence. 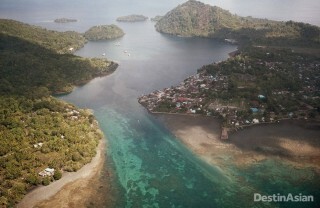 Petani restaurant serves Indonesian cuisine. 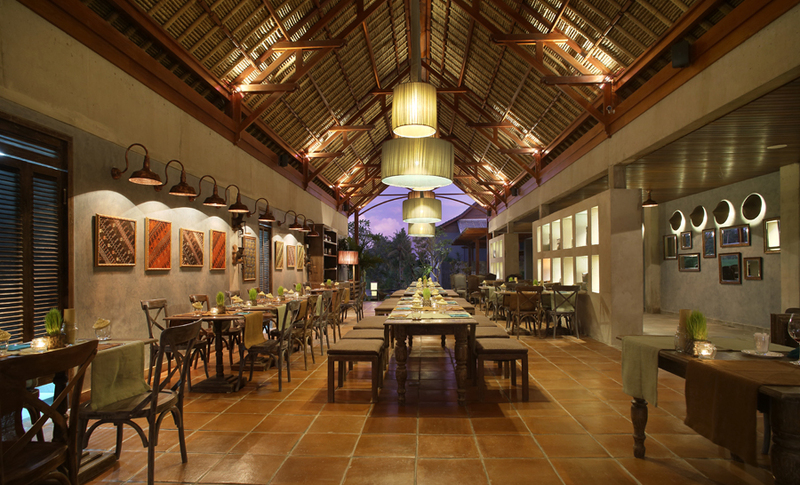 The Appeal: Rich Indonesian cuisine is served at Petani, where the menu is driven by the local island produce; seasonal specialties ensure diners will get the best dishes Bali has to offer. Head to Dala Spa, and request the Manis Klepon treatment, a two-hour massage with a body scrub that uses grated coconut and Java sugar. Or, if prior days spent in the ocean already have you exfoliated enough, try the Island Cocoon, which deeply moisturizes (and smells divine) with grated corn and coconut cream. Pamper yourself at Dala spa. 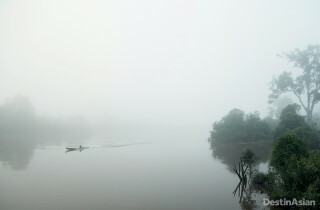 The Surrounds: Though the resort feels altogether secluded, many of Ubud’s main attractions are within walking distance, making it easy for guests to explore the surrounds. And if you want to go further afield, there are bicycles available and rentable cars for day-trips to the temples and ancient villages just outside the artsy city. 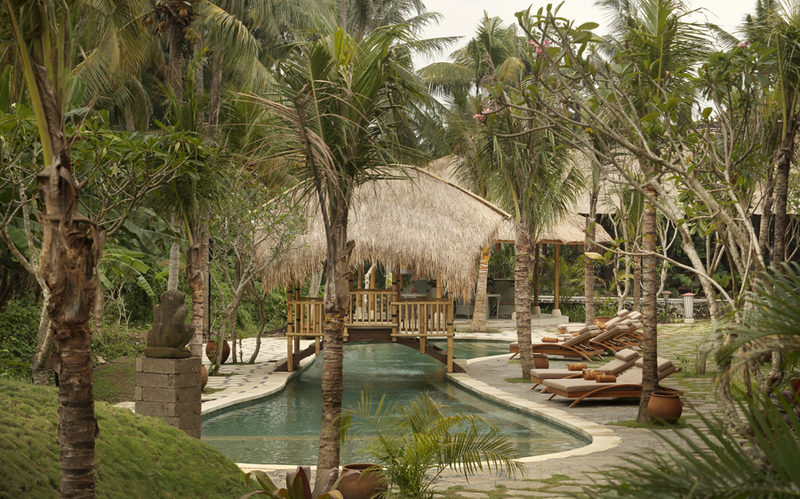 The main pool of Alaya Ubud. 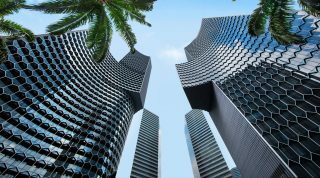 For those in the know: If you came to get away from the outside world, worry not, for the hotel has a lot to offer in-house, from yoga classes to tutorials in making jamu, a traditional Indonesian health elixir. 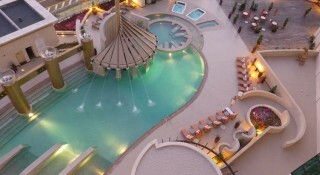 Or, simply spend days relaxing at the main pool while sipping a cocktail or two from the poolside Bamboo Bar.